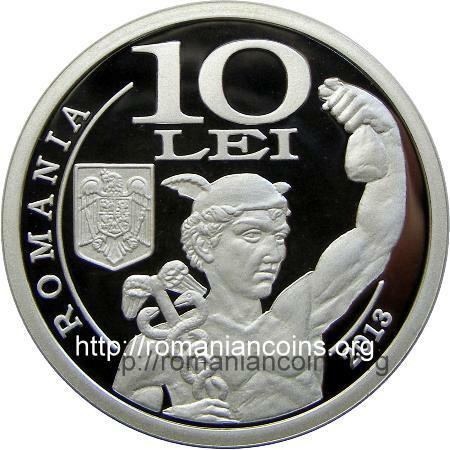 Obverse: ROMANIA, face value 10 LEI, coat of arms of Romania, year 2013, an image of the statue of Mercury (Roman god of commerce) placed on the facade of the old palace of the National Bank of Romania in Bucharest Reverse: names and busts of the three persons who initiated the first congress of the Romanian economists: Virgil N. Madgearu, Ion Raducanu and Ion N. Angelescu, circular inscription "INITIEREA PRIMULUI CONGRES AL ECONOMISTILOR" meaning "INITIATION OF THE FIRST CONGRESS OF THE ROMANIAN ECONOMISTS"
In 1913 an initiative committee made up of young economists has summoned a congress of Romanian economists. Among the initiators were Ion N. Angelescu (1884-1930), C. Georgescu, Virgil Madgearu (1887-1940), Ion Răducanu (1884-1964), M. Săulescu and Victor Slăvescu (1891-1977). 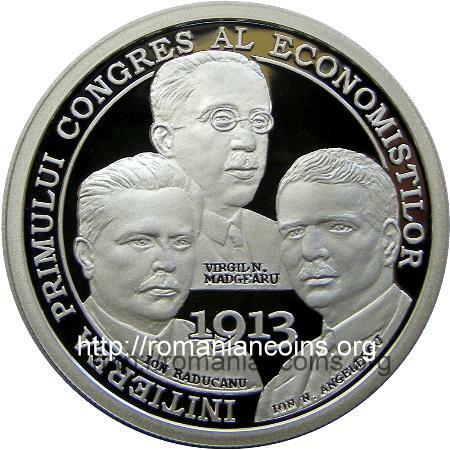 On the occasion of the congress, the Association of Romanian Economists was to be established. Eventually the congress could not be organized, having been halted in project state. Mercury (Hermes at ancient Greeks) bears in his right hand the caduceus, a winged staff with two serpents coiled around it. In the left hand the god bears a full purse, and he wears a winged helmet as headdress. An ancient coin bearing an image of god Hermes struck at Callatis - nowadays Mangalia - can be seen here. Virgil Traian Madgearu was born at Galaţi. He attended economical studies in Germany, in Leipzig, where he defended his Doctor of Philosophy dissertation. In 1916 he became university professor at the Academy of High Commercial and Industrial Studies, established in 1913. He was an important member of the National Peasants' Party, being considered one of its theoreticians. He was minister for several times. In 1940 he was assassinated by legionaries in the forest of Snagov (in the same day was also killed Nicolae Iorga). In 1990 he was post-mortem elected member to the Romanian Academy. Ion Răducanu studied in Austria-Hungary and in Germany, where he also defended the Doctor of Philosophy dissertation. He was a professor at the Bucharest University and then at the Academy of High Commercial and Industrial Studies (where he was also rector for an entire decade). He was minister for several times. Ion Angelescu attended the faculty at Bucharest, defending his Doctor of Philosophy dissertation in Germany. In 1919 he was finance minister for almost two months. He was professor at the Academy of High Commercial and Industrial Studies and rector of the institution.